The Thing is one of my all time favourite horror movies. Quite simply, I was hooked from my very first viewing and, no matter how many times I watch this film, I always find something new in John Carpenter’s cult horror classic - and enjoy it even more. Released in 1982, The Thing was, of course, a remake of Christian Nyby’s film The Thing From Another World (1951). Carpenter recalls watching the original - aged around four or five - and finding it extremely frightening. In high school, the director then read the short story - Who Goes There? by John W. Campbell Jr. - on which Nyby’s film was based. He was surprised to find a lot of differences between the story and the movie - particularly with regards to the creature’s penchant for imitation. The idea of not knowing who is human and who is decidedly not human fascinated Carpenter. After becoming the first choice director for the remake, he started work on The Thing as soon as he had finished Escape From New York. Pre-production took over a year - the longest time Carpenter has ever had prepping a movie before (or, indeed, since). He has called this time a real luxury - allowing both him and screenwriter, Bill Lancaster, the space to get the story exactly right. Lancaster was attracted to The Thing’s plot, characters and the overall mood of the piece. He loved the idea (from the original story) of being trapped in the Antarctic - amid a growing sense of enclosure and paranoia. 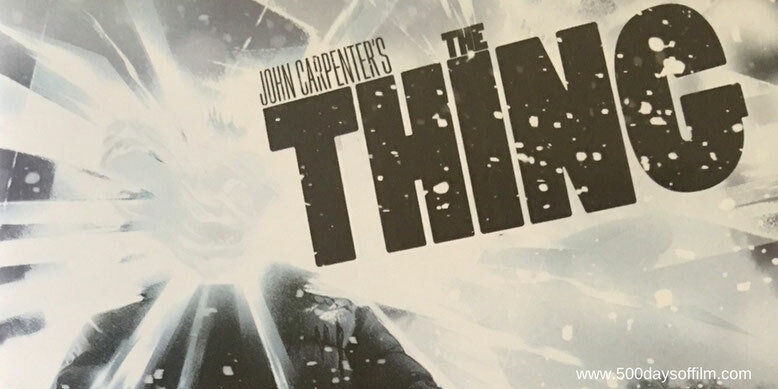 As Carpenter set about building his filmmaking team (including brilliant cinematographer, Dean Cundey) and casting his movie (and what a superb ensemble cast he assembled), the script for The Thing was passed to Production Designer, John Lloyd. Lloyd has called it “one of the best Sci Fi films I have ever read”. The movie had some very obvious challenges - location being one major issue. Despite this, luck was with The Thing when the perfect site was found in British Columbia. In the summer, six months ahead of the shoot, designers and builders arrived to construct the set (which was later complemented by Albert Whitlock’s incredible paintings). Carpenter has remarked that the production design on The Thing was so perfect that it made his job easy… but nothing was easy on The Thing. Winter arrived and the shoot began - bringing with it a host of technical and logistical issues. Even getting the cast and crew to the set proved treacherous. Far from pushing them to breaking point, the unbelievably difficult conditions bonded the cast and crew. In the 36 years since The Thing’s release, many actors have talked about how Carpenter created a positive and supportive atmosphere on set. Many scenes did not have to be filmed in freezing British Columbia. These were shot on the Universal lot in California. However, this also proved challenging - how could the filmmakers convey the severe cold? Eventually, Carpenter and his crew decided to refrigerate the sets whilst also boosting the humidity. This did the job but proved a punishing environment for the cast. Los Angeles was in the midst of a heat wave at the time and the extremes of hot and cold caused many people involved in the film to become ill. Sadly, this was not the only instance of illness associated with the making of the The Thing. Famously, after his stellar work on the film, special effects legend, Rob Bottin, had to be hospitalised. A huge fan of John Carpenter, Bottin was desperate to work on The Thing. Having seen his work on Joe Dante’s The Howling, Carpenter decided to give the 22 year old a chance. The director's main concern was that the creature would look real and not be dismissed by the audience as just “another man in a suit”. Bottin let his imagination go wild - exploiting the monster’s ability to copy anything it sees and suggesting that the designs could take the form of a combination of the creatures that ‘The Thing’ has imitated. The practical effects developed by Bottin for The Thing are one of the main reasons why, after all this time, the film is still such a joy. Of course technology has moved on significantly, but those incredible, iconic scenes remain stunning. They were also extremely arduous to create. Everything was perfectly designed - down to the last minute detail. For example, the famous chest-opening scene was the result of a particularly painstaking process. Charles Hallahan’s chest was copied so perfectly (including his chest hair patterns) that cast and crew members couldn’t tell the difference. Bottin also made exact replicas of Richard Dysart’s arms out of jello with wax bones. Bottin then created a mask of Dysart’s face and placed it on the head of a man who had lost both his arms in an industrial accident. Wearing the jello arms, the man was then able to take part in one of the most shocking scenes in horror. Another iconic feature of The Thing is its title. Designed by Peter Kuran, this effect was actually rather simple to create. First, Kuran filled a fish tank with smoke. He then drew the The Thing’s lettering on an animation cell and put it on the back of the tank. Behind that, Kuran placed a plastic rubbish bag, stretched over a frame. He then positioned a light to shine up on the letters. The bag was then touched with a small flame so that it opened up to expose the title. Deceptively simple but enduringly iconic. Meanwhile, the amount of work that Bottin undertook to bring his imagination to life on The Thing soon took its toll. He and his team simply weren’t able to create all of the effects in the time available. As a result, Bottin asked another special effects legend, Stan Winston, for help. Winston and his team were responsible for the dog puppetry at the beginning of the film. This is the first creature effect that we see and it is utterly breathtaking. However, The Thing is very much Bottin’s film. He worked seven days a week for 57 weeks - living on the Universal lot. A combination of stress and exhaustion led to Bottin being hospitalised at the end of the process. Thankfully, he made a full recovery and decided to address his work/life inbalance. Given today’s love for The Thing, it seems impossible to believe that it wasn’t a critical and box office success back in 1982. However, Carpenter’s film took quite some time to find an appreciative audience. It certainly didn’t help that The Thing was released within weeks of another, more benign cinematic space visitor - Steven Spielberg’s ET. Perhaps audiences wanted cute and cuddly aliens not relentless, shape-shifting killers. In addition, the film’s gore-heavy special effects also proved off-putting for initial audiences. On The Thing’s release, Roger Ebert stated that the movie was “basically, then, just a geek show, a gross-out movie in which teenagers can dare one another to watch the screen. In addition, The Thing’s ending was seen as unremittingly bleak at a time when audiences wanted a more satisfyingly upbeat conclusion. Carpenter did face some pressure to change the end of his film but, quite rightly, stuck to his guns. I have never found the end of The Thing to be bleak. For me, it is both heroic and moving. The initial negative reaction to The Thing was heartbreaking for Carpenter. However, in the 36 years since its release, the film has found an (extremely loyal) audience… and then some. Many people now cite The Thing as one of their favourite horror movies. Thanks to the incredible work that went on behind the scenes, The Thing feels timeless - a movie that never fails to grip, impress and shock.